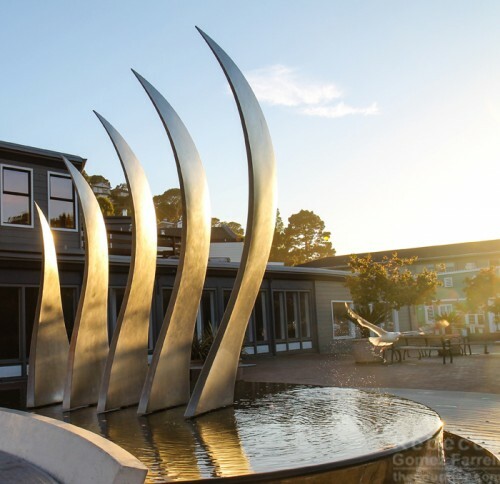 The Lodge at Tiburon, and its restaurant, the Tiburon Tavern, are located just a hop and skip from the scenic old shipping town’s shoreline and historic Main Street. 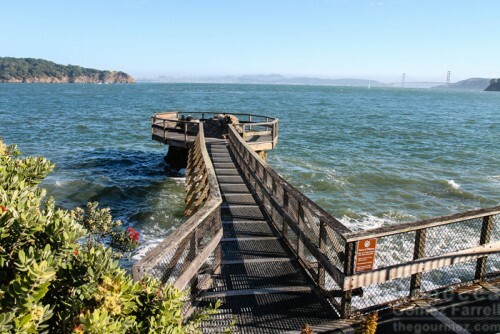 You won’t even need to jump. 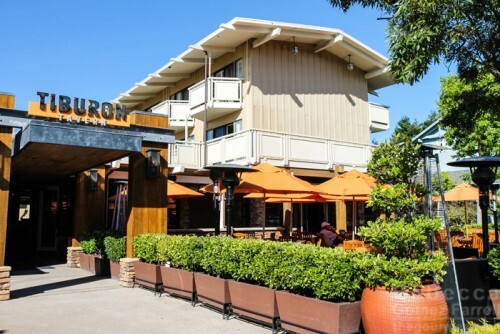 A weekend ago, I was invited out to sample Tiburon Tavern’s new brunch menu, and because my husband’s birthday was the same day, we decided to make an overnight of it. Marin is only across the Bay from Oakland, but any excuse for a different view of the water is one worth taking, right? Obligatory disclaimer: Our meal and drinks were complimentary, and we received a discounted room rate for the stay. 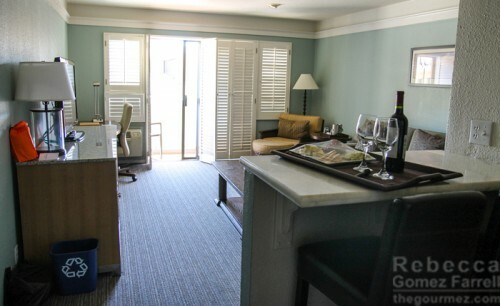 We also received a great room upgrade, a cheese platter, and a bottle of delicious wine. Yes, I’m just trying to make you jealous at this point. And with the Tavern’s new chef, Mo L’Esperance, at the helm, you should be. We found out she arrived just a day before we did! Having a bloggers’ brunch preview the next day is certainly hitting the ground running, and L’Esperance was excited to share a few dishes she’s hoping to incorporate into the menu soon, as well as some of the Tavern’s regular fare. The mozzarella and tomato salad certainly started things off well! From the description, I was worried it would be too simple of a dish to impress, but Chef L’Esperance is capable of making the simple memorable. Each ingredient’s summery freshness shone through, and with just the right amount of salt to highlight the tomatoes, it sang. 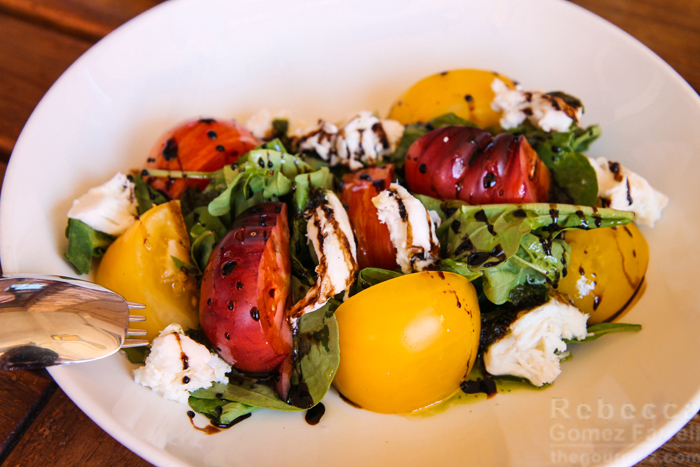 There’s a reason for the omnipresence of caprese salads on menus. When done well, they prime taste buds for what’s to come. 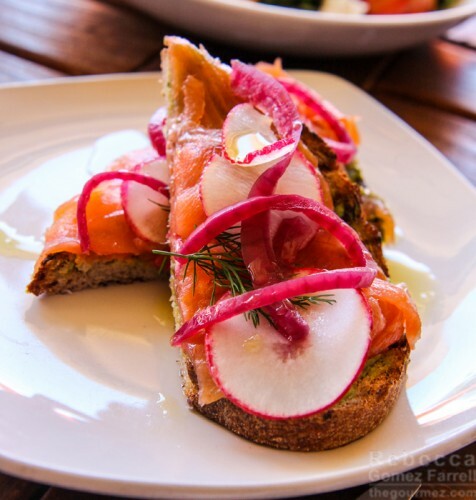 Another starter, the avocado and lox on toast, is also a common dish, but this incarnation elevated it. As you can see from these first two dishes, pleasing the eye first with vivid, contrasting colors is a strength of Tiburon Tavern’s. An overly generous helping of lox melded right in with the avocado’s lushness, and the pickled red onions and slight bite of radish made that richness easier to indulge in. My one suggestion would be a thicker slice of Panorama bread to support it all. I also think the salmon may have been smoked rather than brined, but I’m not complaining about that as I much prefer the former. Chef L’Esperance isn’t the only talent in the back of the house. General Manager Brian Campagna helms the bar’s creations, and he came up with two lovely, sophisticated cocktails. For the appetizer course, this white nectarine bellini took control. I thought it an excellent drink. 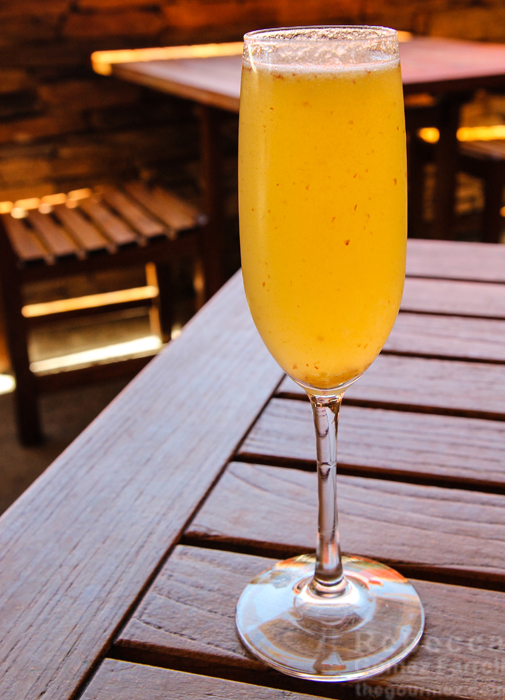 Nectarine provides much less by way of sweetness than orange or peach, the most common bellini and mimosa juices. Being as I tend to prefer grapefruit combos, this was perfect. In combination with a quite dry Caposaldo prosecco, it woke me just as well as my cup of coffee. If you prefer your breakfast drinks layered rather than sugared, it’s an excellent choice. The BC Refresher–a beet, cucumber, lime, and Gran Dovejo tequila concoction–was also a unique and fun choice, especially on a warm afternoon. Again, Tiburon Tavern’s colors are spectacular. The drink was most notable for my husband’s willingness to drink it all, as he’s not a beet fan. 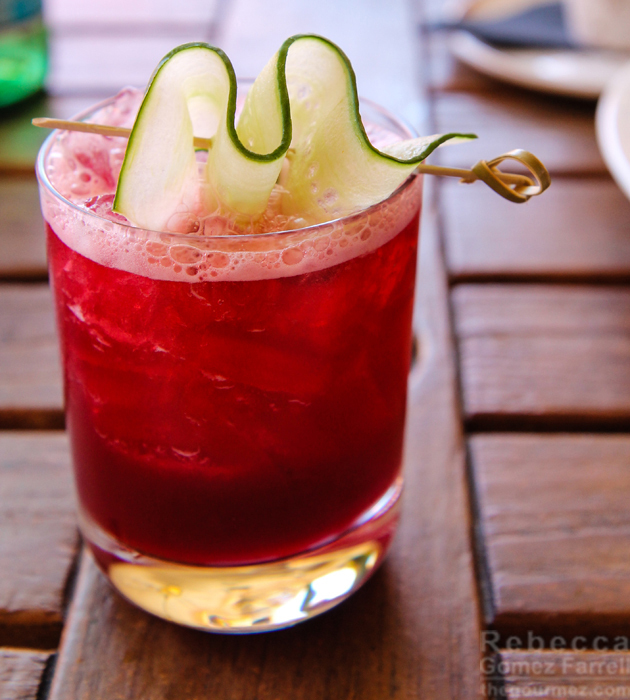 In combination with cucumber, the beet’s earthy dominance became a well-rounded team player. That cocktail was paired with the main entrees. 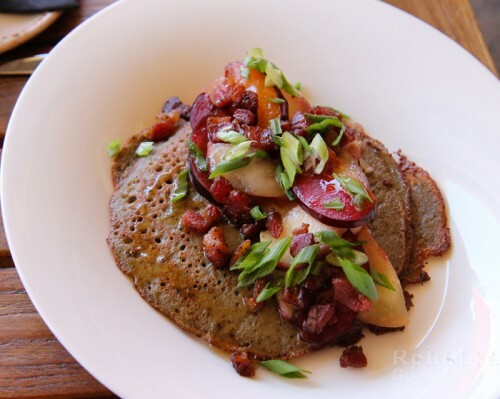 Above is my husband’s Pancakes Anneliese, a potato pancake recipe that Chef L’Esperance has long been working on. It’s made with a smooth, bubbly batter–notably not middle European in style, so don’t expect grated, or chunks of, potato. Instead, the pancake was slightly sweet and light, and I loved its combination with stone fruit and the crunchy contribution of crispy pancetta chunks. The breakfast tacos are different from any others you’ve tried. 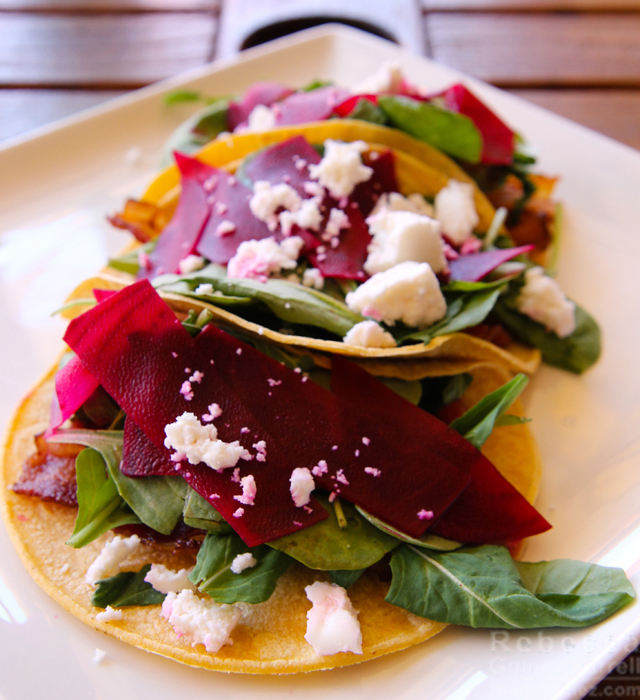 No, that’s not fruit leather on top but thin strips of pickled beet that hide arugula, avocado, queso fresco, extra crisp bacon, and a charred salsa verde. On first bite, I was skeptical but quickly won over by the novelty of a breakfast taco that felt and went down light and tasty. The salsa verde was the most essential element, and I enjoyed the depth of flavor and moisture it added. The dish would benefit from more of that moisture, but I think it’s wise to keep it on the lighter side, so I don’t think sour cream or a cheese sauce is the way to go. Maybe just a lot more salsa verde! As mentioned, it was the husband’s birthday, and they made him a special birthday treat to end the meal. This is a slight modification of the blondie sundae on the regular dessert menu and OH MY GOD, ORDER IT. 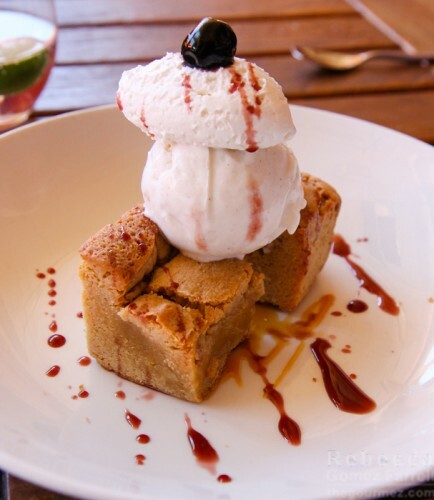 The blondie has such a delightful texture, teetering on the edge of molten. Quality vanilla bean ice cream accompanied it, and I never kick a good amarena cherry out of bed–I mean off the plate, never off the plate. Other desserts currently include a chocolate croissant pain perdu and bananas foster pot de crème. In case you can’t tell, I think brunch at Tiburon Tavern is a great choice. At $8 to $19 for breakfast and sandwich items, it’s also a potentially affordable choice, which can be hard to find in Marin or anywhere in the Bay Area, especially for this quality of craftsmanship. Entrees are available at an extra markup of $5 to $10. I’ll write up a separate post on the Lodge itself soon, with pictures of the grounds and that nice room upgrade. Thanks again, to Chef L’Esperance, General Manager Brian, and everyone at the Lodge at Tiburon and the Tiburon Tavern for the great introduction to Tiburon hospitality. Here’s looking at you, kid. Brunch took place 26 June 2016. A fun and most delightful review! Had my mouth watering!